Two drills for you this week, as I missed last week. I’ll give you two sets of offensive scoring drills. 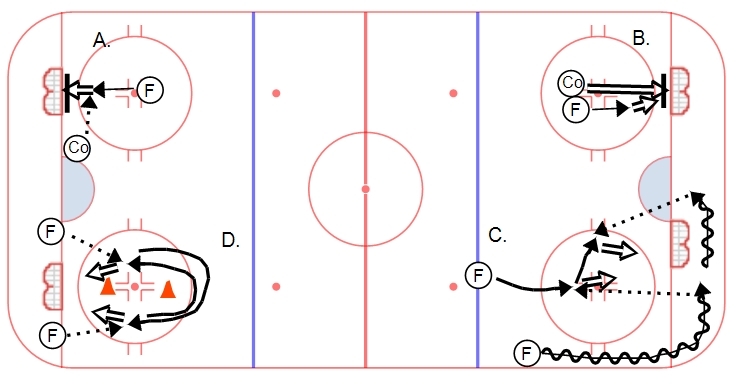 These are drills that work on a forwards ability to finish with the puck in tight to the net. Drills are laid out clockwise, starting in the top left corner. A. One-time redirects. Forward starts at the top of the dot (barrier covers the bottom part of the net). Forward accelerates towards the net, coach fires a puck to the top of the crease where the F gets heavy on his stick and redirects the puck into the upper part of the net. Drive hard to the net and finish in tight. B. Rebound scoring. A barrier covers the bottom part of the net. Coach and Forward start from the hashmarks. Coach fires a puck at the barrier as a forward accelerates towards the net. Forward has to collect the rebound and either make a move around the barrier or lift the puck over the barrier. Collect the puck and quickly maneuver in tight. C. Net drive/pass out. Forward drives along the wall and makes a pass to another F driving the middle lane either before or after the net. Another forward or coach puts pressure on the driving forward, dictating where and how he has to make a play on the pass out. D. Pop out shooting. Forwards always face the net. Two forwards have pucks on either side of the net. Forward starts in between the cones, receives a pass and quickly releases the puck on net. As soon as he shoots, he backpedals around the top cone, accelerates into the slot on the other side to receive a pass and shoot. He then backpedals and the drill continues. After a few reps going backwards, the forward shoots and then moves forward around the front cone, then backpedaling to the slot. All of these drills work forwards on play in tight around the net. Quick reactions, good hands, heavy sticks, and accurate shots are all important in these drills. Every effort should be made to do these at game pace – if you don’t practice at game speed you will struggle to translate these skills to a game.